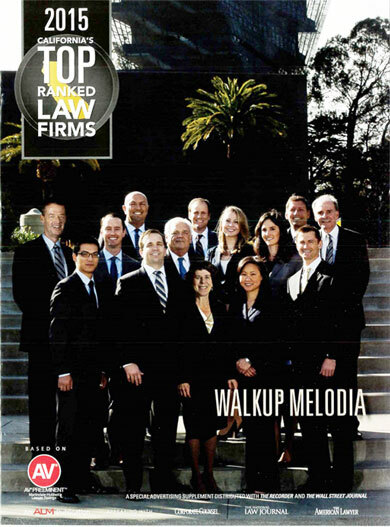 Walkup Melodia has been featured in both The Recorder and The Wall Street Journal with the honor of being named California’s Top Ranked Law Firms for 2015. This ranking is based on Martindale Hubbell the firms AV-PREEMINENT rating. The AV Preeminent rating indicates that the rated lawyer has been deemed by his or her peers to have demonstrated the highest level of ethical standards and legal ability. Martindale-Hubbell peer review ratings are driven by the confidential opinions of lawyers and members of the judiciary who provide reviews of lawyers about who they have firsthand professional knowledge.